It’s nice being in London when there is nobody else about. This was pretty much the case at our rendezvous point, Trafalgar Square, at 9am on the morning of Good Friday; A Harris hawk and its keeper patrolled the area to deter the pigeons, and a light drizzle was keeping the tourists away. The four of us were prompt and organised. Packing and kit-lists had been thought of weeks in advance. We each had lots of experience with day-long cycling adventures, which I think helped as it meant we knew the right balance between the serious stuff – such as packing, navigation, staying on schedule – and the fun stuff. With that in mind, our first priority was to take a photo. Next up.. coffee.. courtesy of a Pret coffee shop on the corner of Trafalgar Square. At this point we were starting to receive heckling from the London Brompton Club about our progress, so at around 9:30am we set off. We’d rehearsed this leg of the journey a couple of weeks prior so knew pretty much what the day would have in store for us. The differences today were that the bikes were now heavier with our touring luggage and the weather was a little wetter. 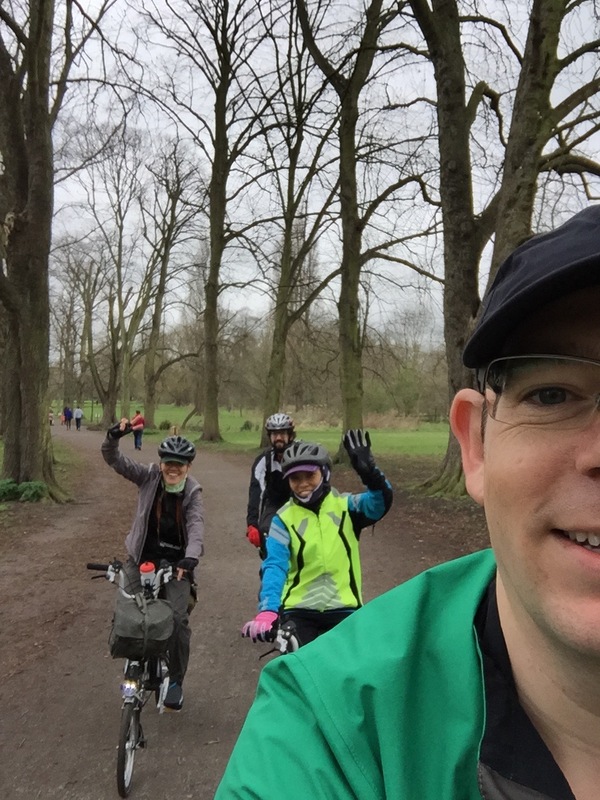 Our route took us out past Westminster, crossing the Thames at Chelsea Bridge, and headed South over Clapham Common before hooking onto National Cycle route 20. This took us along the river Wandle and a lot of the cycling is done on riverside paths. 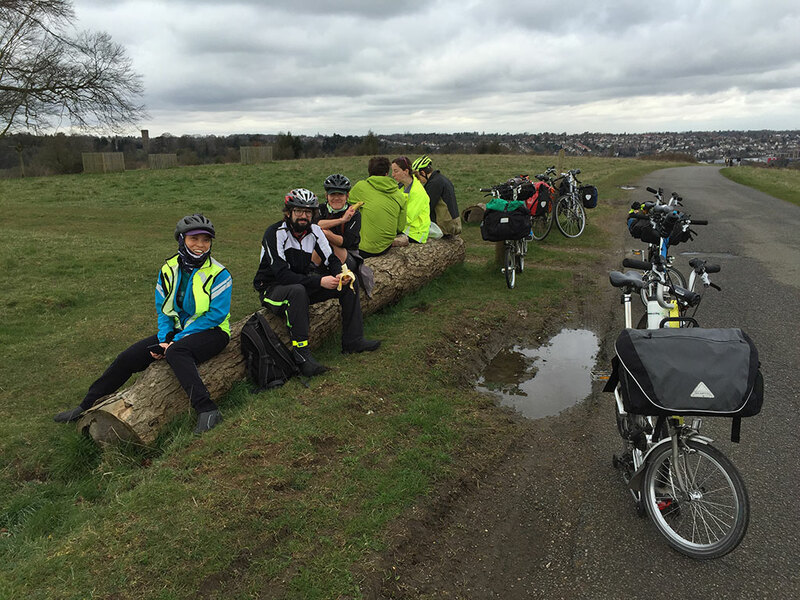 We took a comfort break at the Sainsbury store in Merton, before heading out of London continuing along route 20 through Carshalton, from which point the hills started appearing. After passing through Coulsdon we reached Farthing Downs, which is a beautiful, exposed hill with amazing views. We took a short break at the windswept top, where a couple of other groups of likeminded cyclists were doing the same. Pressing on we crossed over the M25 and out of London. At this point we left the national cycle network and started forging ahead on our own route – chosen so that we would be able to do the journey from London to Newhaven in a day at a comfortable pace. In our practise ride a couple of weeks earlier we had stopped at a tea room in Bletchingley. This time we wanted a more substantial lunch, so held off until we passed a suitable-looking pub, which turned out to be The Bell Inn near Outwood. We had a good lunch here. We continued along in the drizzle and up and down many hills. 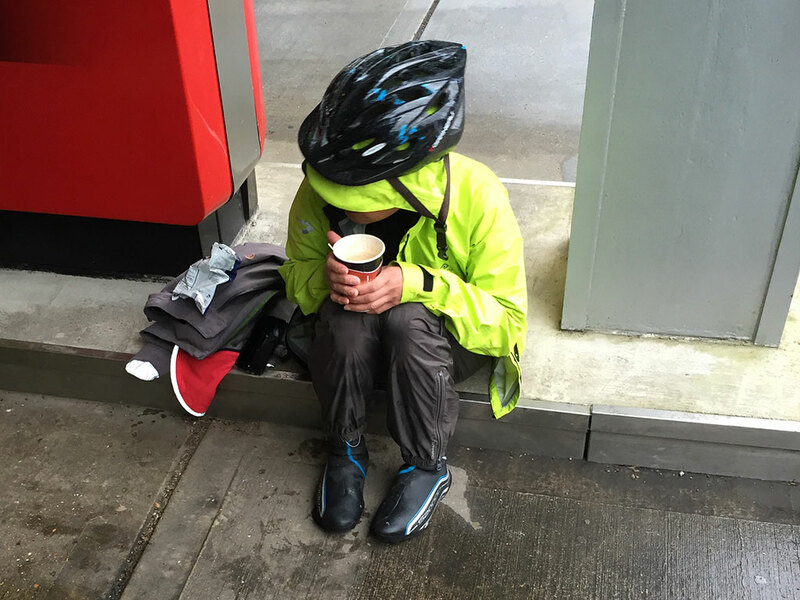 There were many really enjoyable roads for cycling but the rain persisted as an annoyance and it seemed to take forever to reach the next pitstop – a petrol station on the A272 near Piltdown. Hot drinks were needed all round. We were using an app which tracked our route and we were able to share our location in real time on the London Brompton Club forum. We were receiving running commentary on our progress and on the pictures we posted. This was fantastic and cheered us up a lot. 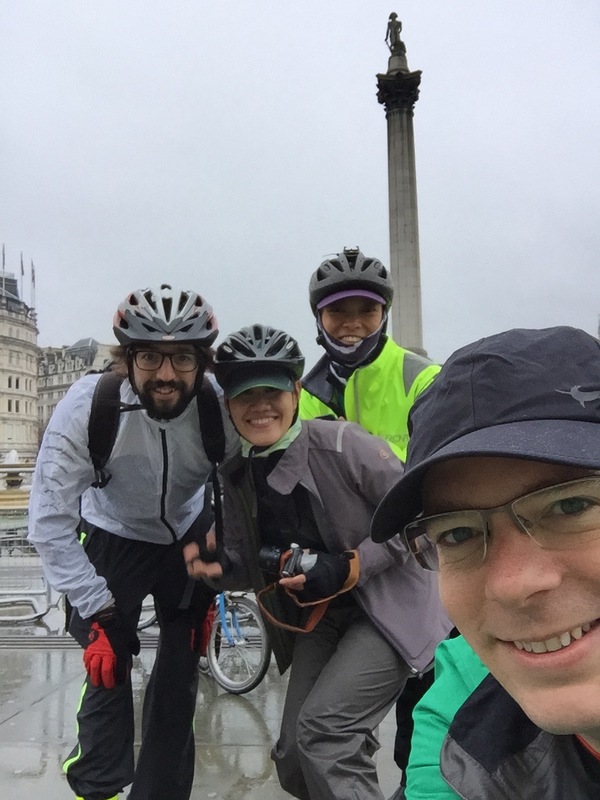 Coincidentally, LBC Chris was also cycling London to Paris on her Brompton over the Easter weekend with friends. Her route was a slightly longer route over more days, but they were headed for the same ferry as us. It was great to read about her progress as we made our own way. As we pedalled on, the sun set and the rain stopped. Approaching Newhaven there was some really amazing cycling on fast, quiet moonlit roads. It felt magical. We arrived at the ferry terminal about an hour ahead of when we needed to check in. Within 5 minutes of us arriving, Chris’ party also arrived. 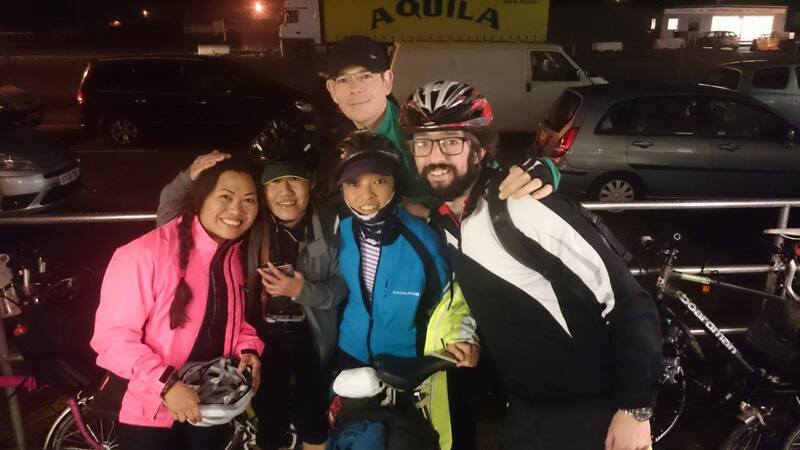 We were only able to chat briefly as as we had less than an hour for dinner – not enough time to comfortably venture in to the town centre, so instead we chose to cycle over to a McDonalds which was close by. By the time we got back to the ferry terminal, Chris and co were already onboard (they went on a cyclists with the cars). We’d chosen to embark as passengers, but this was a pain. My previous experience of embarking as a foot passenger was pleasant, but not so in the case of the Newhaven-Dieppe ferry. We weren’t able to keep our bikes with us – they had to be placed onto a luggage trolley which went separately. It also took a lot longer for us to get onto the boat, by which point most of the ‘sleeper chairs’ on the ferry were occupied by sleeping passengers. We were exhausted but unable to find anywhere to sleep. I tried to sleep seated on the dining chairs which was impossible. Those that had been sleeping on the lounge chairs found them uncomfortable, and the wooden floors were not welcoming. The boat was also lit up brightly, even though most passengers wanted to sleep. Tip: If travelling Newhaven-Dieppe, book a cabin and board the boat with the cars. London to Newhaven, 122 km.